We are a new surf camp based in the beautiful jungle in a small town called Ahangama on the coast of South West Sri Lanka. We’re looking forward to the season and can’t wait to share it with amazing people like yourselves and your groups! The Surf season here runs from November through to April and offers beautiful warm water waves that suit all levels of surfers. Our dedicated instructors have an infinite passion for surf and teaching surf and their love for the waves is infectious, so your customers are sure to have an amazing time with us in and out of the water. Sri Lanka is Asia's hottest new surf destination and we would love to host your groups, teach them how to surf and show them our little slice of paradise. We have a spacious, beautiful dorm room that sleeps up to 10 people and five private double rooms: one with air conditioning, two with private ensuite and balcony and two standard private rooms (shared ensuite). We’re situated five minutes away from the surf surrounded by dense jungle and often spot monkeys and other wildlife from our villa. A massive healthy brunch is included daily and 5 out of 7 dinners for the week. We know how important it is to fuel yourself with healthy, delicious food while surfing and our teams chefs make sure no one ever goes hungry. We happily cater to any dietary requirements you might have. 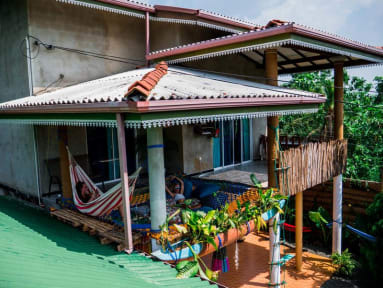 Our Villa and garden is the perfect space to host a yoga or fitness retreat, hidden away in the jungle but with the amazing surf, beaches, restaurants and places to explore right on our fingertips. We are happy to help you arrange extra activities for your guests. Please don’t hesitate to email us if you require any further information or have any questions. We understand that everyone is an individual so we are more than happy to personalize your stay exactly how you want it. It doesn’t matter if you’re already ripping or trying surfing for the first time, on a budget or whatever; if you like good vibes, people, waves and food you’re always welcome in our jungle paradise.